I had the chance to shoot with fellow Clubsnap member fibredrive last week. He brought me to a familiar place (for landscape photographers) at Changi Beach. Told you I was a newbie. Gosh I didn’t even knew the place existed. When we got there, it was like almost 7pm. In my heart, I was like “Well, we missed the golden hour”. Oh how naive I was. Fibredrive proceeded to setup his gear, and composed his shots. Little did I then know that the “Blue hour” actually begins from 7.15 – 7.45 where the camera is able to pick up wonderful hues of blue and orange the sunset was giving. As a newbie, I followed his composition, and took about 20 shots in between a 10 min period. Each exposure ranging from 2 secs – 15 secs. I then used Nik’s HDR Efex Pro and Color Efex Pro to post process it. Quite please with myself on the end result. Certaining given me the confidence to approach the same genre the next time. Hope you like it. Do feel free to give comments please. 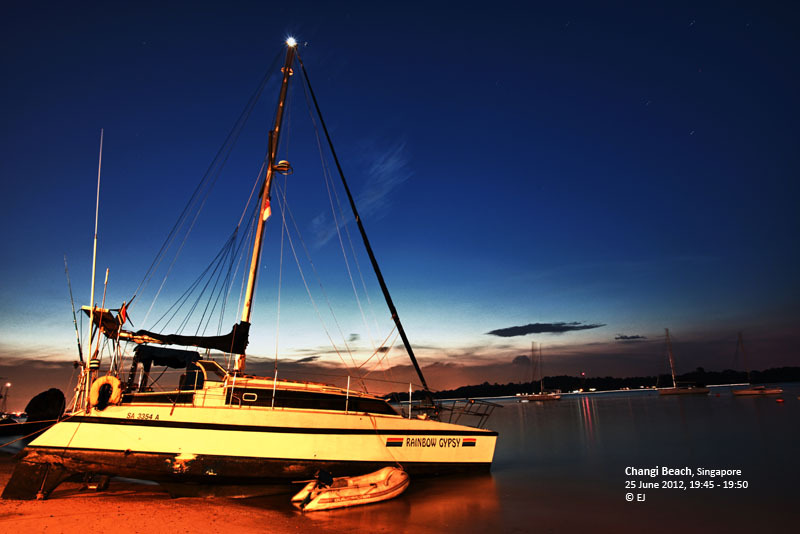 This entry was posted in Landscape Photography and tagged changi beach, efex, golden hour, hues of blue by EJ. Bookmark the permalink.